Start your own business and your life will be over. At least that’s according to model, TV host and business owner Georgina Wilson. But from the looks of things, she appears to be, at the very least, exaggerating, and all in good humor. Pregnant and radiant in a long-sleeved number, Wilson—who co-runs the retail outfit, Sunnies Studios, and its offshoot dining venture, Sunnies Cafe—doesn’t look like a woman whose life has ended. Far from it, it seems. If anything, she is merely stepping into a new chapter in her story and she looks to be doing so with grace. 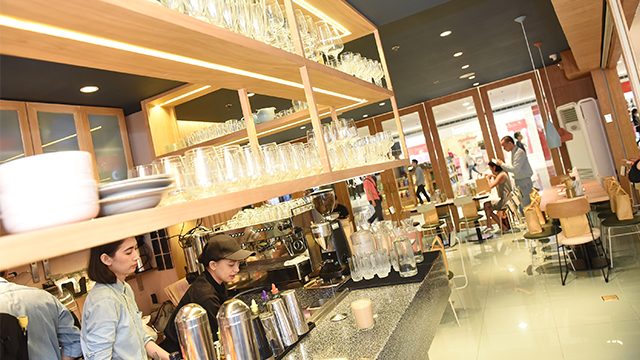 Other than the baby on the way, for starters, Sunnies Cafe has just launched its second branch located in SM Megamall. 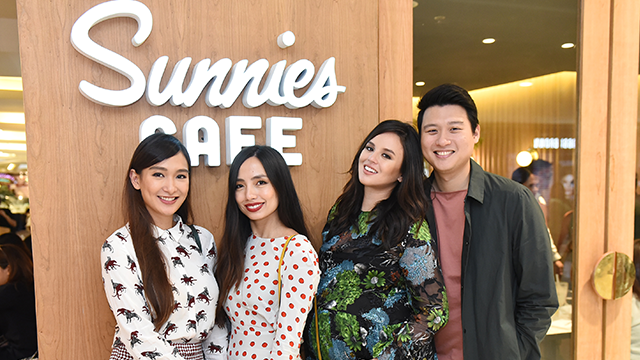 Together with its maiden brick and mortar in Bonifacio Global City, and its flagship eyewear company, the Megamall location is expected to continue solidifying the Sunnies name as one of the more successful lifestyle brands to rise in the Philippines in recent years. Meanwhile, those who would occasionally lurk in her Instagram account may assume that her personal life remains blissful and worry-free. The same can be said of the accounts owned by her business associates in Sunnies (Martine Cajucom, Bea Soriano-Dee and Eric Dee Jr.). Their lives in photos are inconsistent with the common horror stories shared by people who run their own businesses. Make no mistake though: the foursome behind Sunnies Studios do run their own company and they have their own bits of wisdom to share about it. In the case of Wilson, she has this to say: don’t put too much stock on what you see online. “There were times,” she added, “when we wouldn’t sleep.” She said this of course while talking about the time period prior to the launch of Sunnies Cafe. In spite of this, however, she stated that this is exactly where she wants to be. When Georgina first came into the spotlight, it was during the early 2000s and she did so through a slew of endorsement deals with companies like Ponds. It would’ve happened sooner, however. Wilson after all was already getting offers to be a model during her younger years, but since she was a student at Assumption Makati, she could not (it was after all a well-known fact back then that Assumption forebode its students from taking on works as models). Needless to say, she graduated from high school, studied in Ateneo de Manila and eventually became one of the top endorsers in the country. In the midst of it all, however, was a mind made for numbers. A student of economics and eventually finance and accounting, the Georgina Wilson commonly unseen by the public eye was a woman gearing up to be business savvy. “I’ve always been a business woman,” she told Entrepreneur Philippines. “I treated my career as a business, so to me it is only natural to go into business.” And given how she’s doing at the moment, “natural” does appear like a fair word to use. Since its launch, Sunnies Studios as well as its attendant dining venture have been showing great promise. The eyewear company for one began as a small stall selling California-inspired glasses but now, it is a commendable retail presence of around 40 stores nationwide. The cafe, meanwhile, is relatively new (it just launched August this year.) But given the public reception it has been getting—about 300 people on a daily basis spending about Php 500 per visit—the enterprise appears to have quite an impressive potential. Overall, Sunnies is succeeding. And while it is no secret that her 3 other associates did more than pull their own respective weights to make this happen, Wilson was so far from being a slouch in the team. As the marketing director of Sunnies Studios, Wilson was one of the minds responsible for the Sunnies’ meteoric rise. Under her watch, the company developed from a fledging, unknown enterprise to a brand that caught the attention and subsequent fanfare of a wide millennial following. The secret to her success however was not too complicated. “I’m... a millennial,” she stated during her interview with Entrepreneur Philippines. This meant the she herself was a consumer of the product she wanted to sell, so she knew what their target market was after. Applying this personal knowledge, Wilson was among the people who decided to market Sunnies Studios as a lifestyle brand and the result of this strategy is as follows: open a package of Sunnies’ sunglasses and what you get is more than eyewear, what you have is a piece of the Southern California lifestyle that its design was inspired by; that easy-going, commonly beach-ready, palm tree-shaded existence that many have longed for but has yet to get a chance to try out. Of course, the moral of the story is not simply about the virtues of becoming a lifestyle brand. The fact of the matter is, much of the marketing success of Sunnies relies on the sheer fact that it was created and managed by minds who could relate to who their customers are, because they are not that different from them. “Authenticity,” she said. That’s the key, especially when it comes to marketing to and attracting the young and trend-savvy, those who commonly have Internet access on hand and are more than capable of searching online to verify claims almost anytime, anywhere. And considering the standing of her business, she is well within her authority to say this. There she was, after all, at the launch of yet another promising venture and on the heels of a successful one—beaming from ear to ear for another photo to be posted on social media.